PLEASE NOTE: OUR DEDICATION EVENT HAS BEEN POSTPONED UNTIL JULY 31st, from 12-2pm. We are excited to announce that construction on the Gyori Health & Wellness Centre has begun. This new facility will serve to improve the overall care of our campers while at camp. Being built in memory of our founder, Louis Gyori, we have been thrilled by the support received thus far from families and alumni. If you are inserted in getting involved, take a look at the information below. 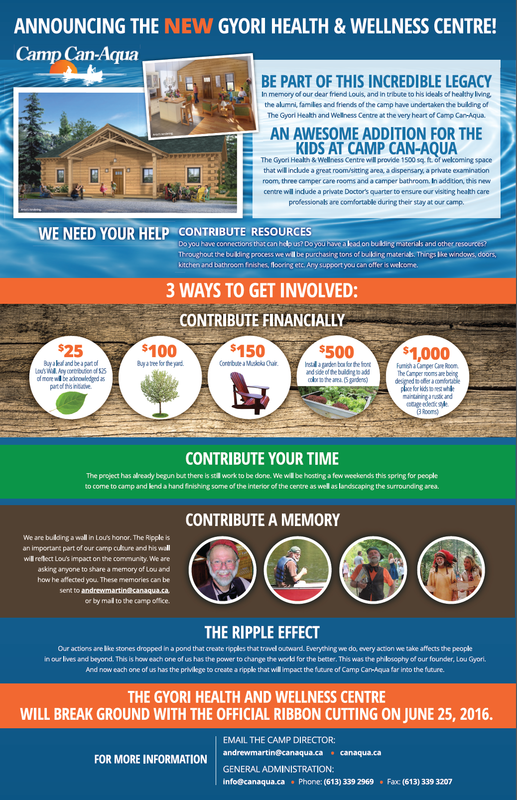 With three ways to contribute, we hope everyone will get involved with the build and help us realize this terrific addition to Can-Aqua. All contributions will be recognized and names of donors added to a plaque on the wall of the Wellness Centre’s “Great Room”. All alumni, family members and friends of Can-Aqua are invited to a special ribbon cutting ceremony at Camp on July 31st, 2016. Camp Can-Aqua is not a registered charity and as a result, we are unable to provide donation receipts. Through the generosity of our community, we will honor our founder with a building that will benefit campers today and in the future. For those interested in helping with building, landscape and finishes, May 13-15 is our Alumni Build for Louis/Camp Opening weekend. Take a look at the event on Facebook. All memories can be sent to the director at andrewmartin@canaqua.ca and will be included in the creation of Louis’ Wall. Parents want their kids to become self-confident, independent, resilient individuals prepared to meet the challenges of today’s world. Summer Camp offers a unique environment. Living away from home provides campers with a community living experience without parental or teacher influence and led by well-trained camp staff, whom are viewed as peers and friends. Living together with their peers, summer campers develop important social skills. Getting along, developing tolerance for others, and learning to resolve differences so that everyone feels good about themselves are fostered and encouraged. Compromise is one of the greatest characteristics taught at summer camp. A healthy self-esteem builds confidence and independence. It encourages the willingness to try new things! Positive nurturing techniques used by Camp staff foster a sense of accomplishment, an important step toward developing a resilient self-esteem. At Camp Can-Aqua we have fun. We know that when kids are playing and having fun, learning and and developing leadership skills, amazing things happen. There are friendships to be cultivated, decisions to be made, and successes to be experienced, all in the name of fun! Ontario summer camps are unique and internationally respected. This camp experience is one, which allows your kids to experience a global perspective among peers. Can-Aqua’s traditional camp setting is an ideal platform for positive growth and development.